De Beers allows complete deferrals given continuing poor market conditions. Lucara Diamond Corporation unearths worlds 2nd and 6th largest diamonds in 1 week. Exceptional diamonds defy price deflation: 12.03ct vivid blue sells at $48.5m. De Beers suspected giving preferential deals to 'sweetheart' Sightholders. GRN and De Beers fail to finalize sales agreement to date, leaving Sightholders in limbo. Laurelton (Tiffany) closes its diamond factory in Windhoek, giving another major blow to beneficiation. A visionary and pioneer in Namibia, its diamond cutting and polishing factory was one of the first of its kind, focused to mutually beneficiate both investor and host country. Established in 2001 when no industry or local supply yet existed, HSP assisted Namibia to map 'beneficiation' through diamond cutting and polishing. The joint hard work, persistence and commitment provided the groundwork for what is today a young but flourishing industry, with over eleven factories established, processing world class Namibian diamonds. 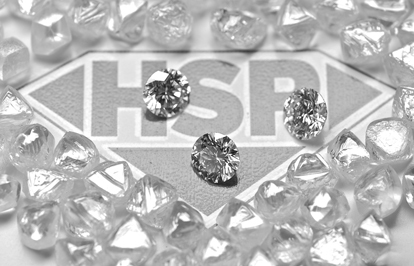 HSP is the leading Namibian diamond brand.